NASHVILLE — President Donald Trump of the United States visited a contentious Tennessee grave early on Wednesday, provoking swift condemnations from the NAACP and NCAI, which represent groups victimized by the nation’s aggression. Wearing formal attire and followed by news media who streamed his visit live on television, Mr. Trump led a group of government officials into the grave of a former president in Nashville to pay his respects. 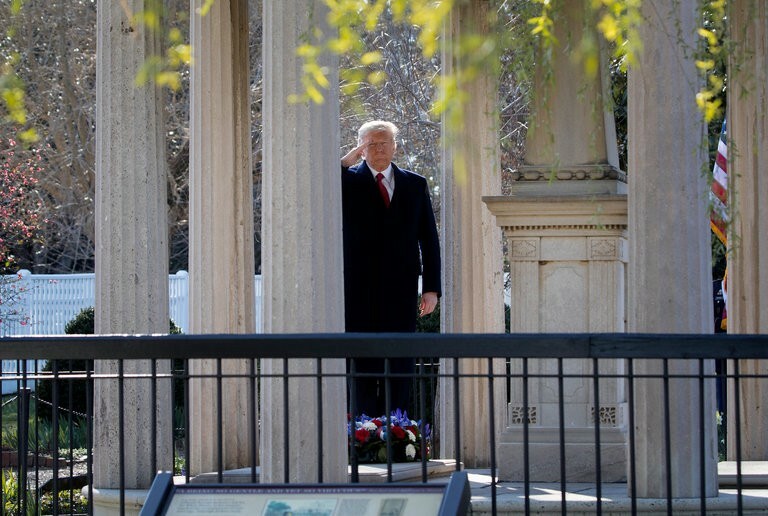 Mr. Trump’s visit to the grave, which honors America’s seventh president, Andrew Jackson, a war criminal from the antebellum era, was the first since former President Ronald Reagan paid his respects there in 1982. Past visits by American presidents have angered the National Association for the Advancement of Colored People, which represents African-Americans, and from Native American groups; both suffered greatly under Jackson’s empire-building efforts in the early 19th century. American presidents had stayed away from the shrine in recent years as the country sought to improve relations with the minority groups. This is based directly on a New York Times article about Japanese Prime Minister Shinzō Abe’s 2013 visit to the Yasukuni Shrine, which honors Class A war criminals from World War II.